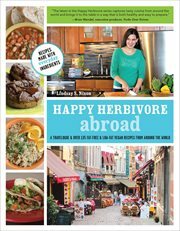 The item Happy Herbivore Abroad : a Travelogue and 125 Fat-free and Low-fat Vegan Recipes from Around the World, (ebook) represents a specific, individual, material embodiment of a distinct intellectual or artistic creation found in Charlotte Mecklenburg Library. In the span of a decade, Happy Herbivore chef Lindsay S. Nixon lived in eight states, visited forty-six, spent a year as an expat on a Caribbean island, and traveled to more than thirty-five places abroad. As a celebration of Nixon's jet-setter lifestyle, Happy Herbivore Abroad combines traditional comfort foods from home with international inspiration and stories of her adventures. A little of everything-basics, comfort food, international cuisine, and travelogue-Happy Herbivore Abroad provides your palate with more than 135 of Nixon's crowd-pleasing vegan recipes low in fat, high on health, and made with everyday ingredients. True to the Happy Herbivore creed, these vegan dishes are easy to make, easy on your wallet, and completely plant-based. As they say in France, bon appťit!